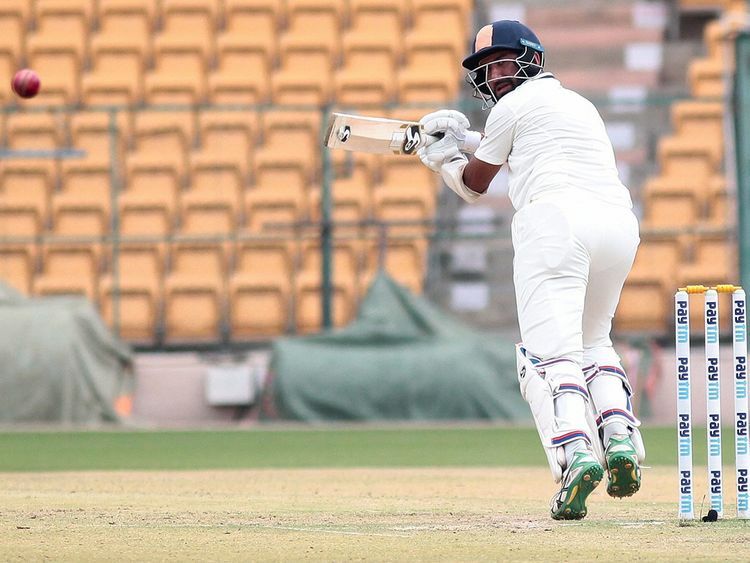 Bengaluru: The Cheteshwar Pujara juggernaut continued to roll and the 'Run Machine' steered Saurashtra to the Ranji Trophy finals with a five-wicket victory over Karnataka in the Ranji Trophy semi-finals here Monday. Saurashtra will now meet defending champions Vidarbha in the final of the national championship to be played from February 3-7 in Jaipur. This is the third time that Saurashtra will be playing the finals. Pujara remained unbeaten at 131 off 266 balls and added 214 runs with senior player Sheldon Jackson (100) to anchor another successful run-chase for Saurashtra. Needing 55 runs on the final day, it was a mere formality as Jackson duly completed his 16th first-class century. Although they had seven wickets in hand, Pujara didn't take any undue risks and it took 17.4 overs for Saurashtra to score the remaining 55 runs. Vinay Kumar (3/75), who bowled his heart out and was unlucky after Pujara was ruled not out by the on-field umpire despite a clear edge when he was on 32, got the consolation wicket of Jackson. However, the match was as good as over by then. Pujara's innings had 17 boundaries while Jackson struck 15 hits to the fence. The best part about Pujara's innings was his intensity. After his most defining away tour for India, the 31-year-old looked like continuing from his century in Melbourne. His sequence of scores since the start of the Australia series now stands 123, 71, 24, 4, 106, 0, 193, 11, 67 not out, 45, 131 not out. Pujara did get a couple of lucky reprieves in this match but it could be blamed on the umpiring standards which have been below par during the season. Umpire Saiyed Khalid, who had a forgettable outing, is expected to get negative marking and will certainly be demoted to a lower grade during the next season if well placed sources in the BCCI are to be believed. His howler did affect Karnataka's chances but to Pujara's credit, the controversy hardly perturbed him and it was business as usual for him. His zen like approach was at a different level, his only mission being to take Saurashtra into the summit round. A testimony to his unflappable temperament was that the "cheater cheater" boos by the home team supporters didn't unsettle him. In the end, it was 'Mission Accomplished' for Indian cricket's 'Man of the Moment'.